Is this a good deal for $950 AUD? Sorry if Gumtree isn’t allowed, I figured it was kind of ebayish. Please don’t snipe me if it is good I’m just a poor boy. Wheels and fork are quality. Rest is average (except stem) and probably worth about $150 together. So would you pay $800 for the forks and wheels? It’s an ok deal but not amazing. And do you even need the forks? What frame is it going on? I wouldn’t buy it unless you needed all the parts or were willing to on-sell what you don’t need. Answer these questions honestly Plez. 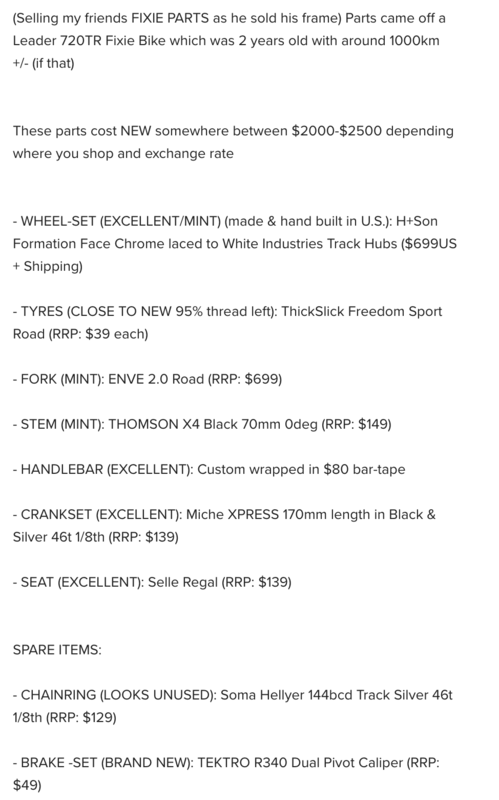 If you don’t need the fork you might get $250-$300 for it, the rest may sell in dribs and drabs, yeah, for like $150… wheels worth $500 to you? Are they for street or track? If for a track build, then no, not worth it. Nice stuff all the same but hey Everyones comments so far are spot on. alrighty, cheers for the replies guys, i don’t really need any of it to be honest, I was just looking for that particular pair of forks cause a friend said theyre good, but it was mostly just for interest, if it was a really good deal I might’ve jumped on it, but I can pass it up.